The distinctive pedestal leg is inspired by the arches and gilded domes typical of Middle Eastern architecture – Bethan wanted to capture the experience of exploring a new city and seeing the sunlight bounce off golden roofs. The quality of the craftsmanship is evident through the delicate balance at the points of connection between the marble and brass and in the case of the Dhow version in the skill required to overlay over 100 metres of solid brass onto the marble. The Lustre family's radiance and luminescence comes from its generous feature use of brass appearing in a meticulously crafted brass tray that holds the marble top, and in the substantial spun pedestal base. 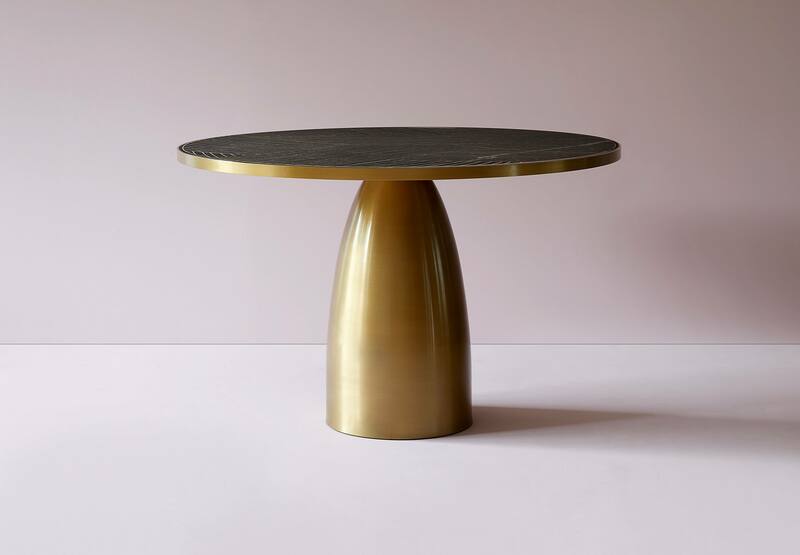 The Lustre table comprises a spun brass pedestal topped with marble encased in solid brass. The table top is available in Carrara, Marquina, Guatemala and Salome marble with the option of having the Dhow pattern inlayed into the marble in brass. The family includes dining tables seating from four to 10 people – circular dining tables with a single pedestal are available in three sizes and ellipse dining tables with two pedestals are available in two sizes. Coffee and side tables each available in two sizes complete the family.